Notes: A Henry Herbert suit, made with the mystical Harris Tweed. A finely cut suit that looks striking on the young man wearing it – Marcus Jaye, creative director of The Chic Geek. The remarkable Harris Tweed is the only fabric in the world that is governed by its very own Act of Parliament 1993: “Handwoven by the islanders at their homes in the Outer Hebrides, finished in the Outer Hebrides, and made from pure virgin wool dyed and spun in the Outer Hebrides.” The Act ensures that all cloth certified with the Harris Tweed Orb complies with the definition in the Act, and is genuine. See also: A Henry Herbert, bespoke suit, country suit, Harris, harris tweed, Henry Herbert, Henry Herbert Tailors, london college of communication, magical qualities, Marcus Jaye, outer hebrides, Petra Exton, photography credit, reviews of bespoke suits, savile row suit, savile row tailor, Shirts, suit, Suits, tailored shirts, tailored suit, the chic geek, Tweed, wedding suits. Henry Herbert Tailors - Harris Tweed Suit by Henry herbert Tailors. 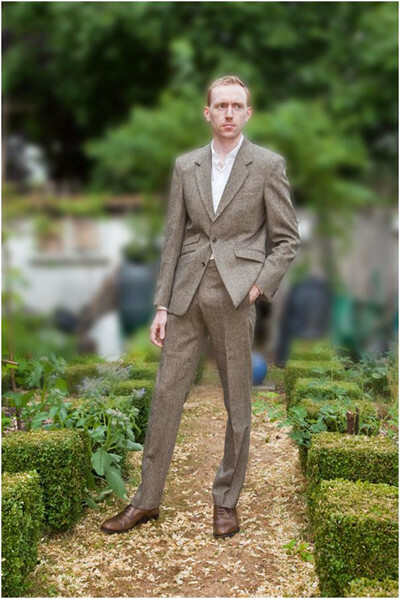 A country suit made with Harris Tweed, the only fabric in the world that is governed by its very own Act of Parliament.